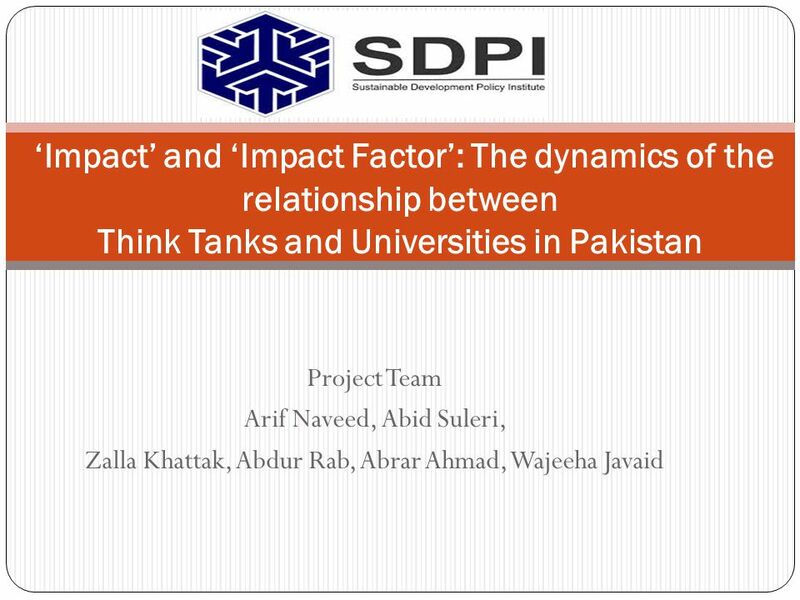 Project Team Arif Naveed, Abid Suleri, Zalla Khattak, Abdur Rab, Abrar Ahmad, Wajeeha Javaid ‘Impact’ and ‘Impact Factor’: The dynamics of the relationship. 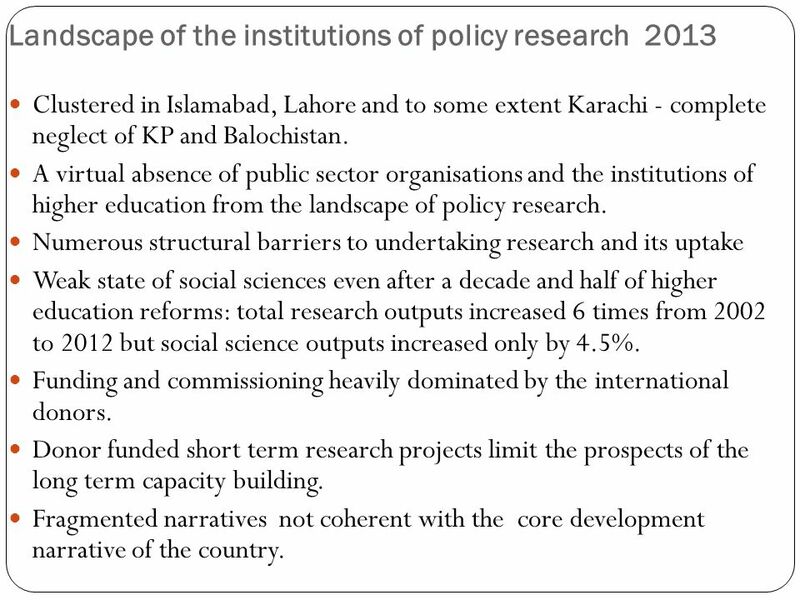 3 Landscape of the institutions of policy research 2013 Clustered in Islamabad, Lahore and to some extent Karachi - complete neglect of KP and Balochistan. 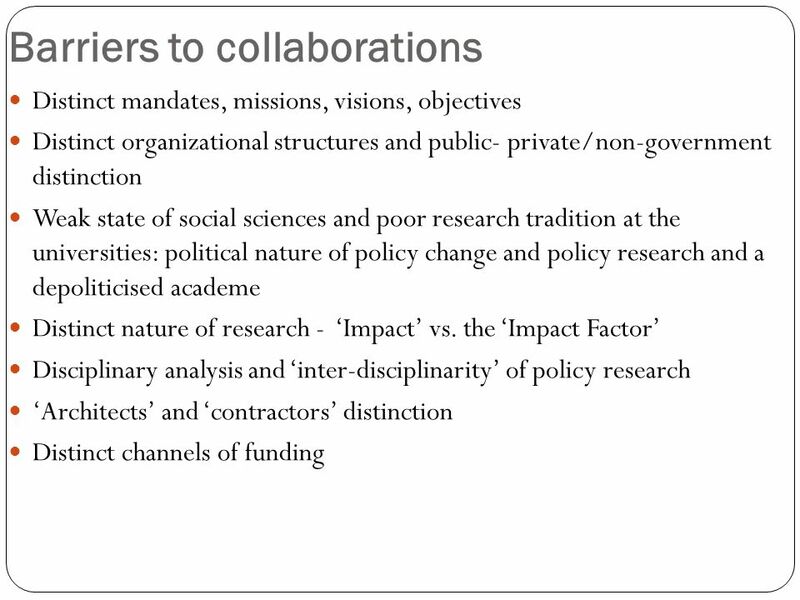 A virtual absence of public sector organisations and the institutions of higher education from the landscape of policy research. Numerous structural barriers to undertaking research and its uptake Weak state of social sciences even after a decade and half of higher education reforms: total research outputs increased 6 times from 2002 to 2012 but social science outputs increased only by 4.5%. Funding and commissioning heavily dominated by the international donors. Donor funded short term research projects limit the prospects of the long term capacity building. Fragmented narratives not coherent with the core development narrative of the country. 4 Objectives of the study Broader objective is to understand; The patterns, drivers, consequences of the relationship between TTs and Universities Ways in which both groups have developed mutually beneficial relationships How does external support affect these relationships? 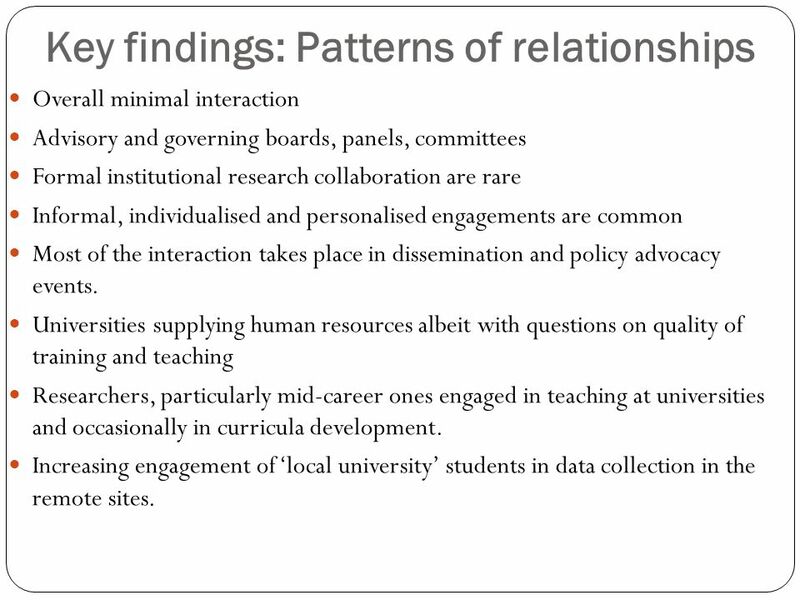 6 Key findings: Patterns of relationships Overall minimal interaction Advisory and governing boards, panels, committees Formal institutional research collaboration are rare Informal, individualised and personalised engagements are common Most of the interaction takes place in dissemination and policy advocacy events. Universities supplying human resources albeit with questions on quality of training and teaching Researchers, particularly mid-career ones engaged in teaching at universities and occasionally in curricula development. Increasing engagement of ‘local university’ students in data collection in the remote sites. 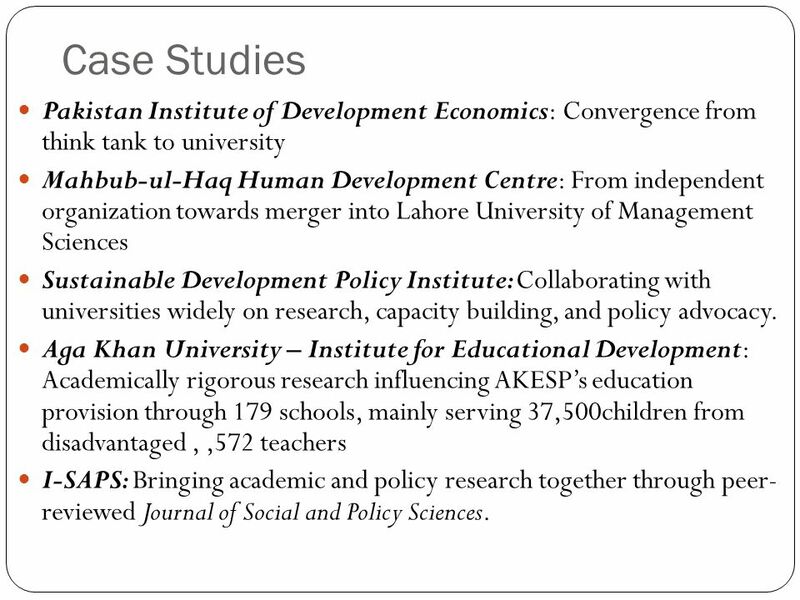 10 Case Studies Pakistan Institute of Development Economics: Convergence from think tank to university Mahbub-ul-Haq Human Development Centre: From independent organization towards merger into Lahore University of Management Sciences Sustainable Development Policy Institute: Collaborating with universities widely on research, capacity building, and policy advocacy. Aga Khan University – Institute for Educational Development: Academically rigorous research influencing AKESP’s education provision through 179 schools, mainly serving 37,500children from disadvantaged,,572 teachers I-SAPS: Bringing academic and policy research together through peer- reviewed Journal of Social and Policy Sciences. 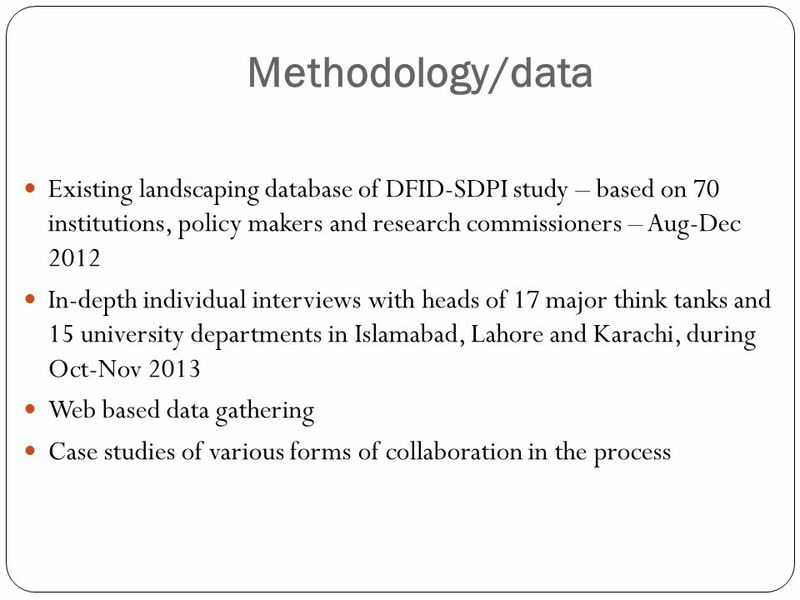 11 Case Studies – some emerging trends Satellite institutional arrangements – ‘star’ academics and researchers based at prestigious universities (usually abroad),collaborating with each other to form research centre in Pakistan, loosely organised around research programmes/projects, winning large internationally competitive grants, designing innovative research projects, producing high quality research and working closely with the government. Lahore based Centre for Economic Research in Pakistan (CERP), International Growth Centre (IGC), Institute of Development and Economic Alternatives (IDEAS) are the key examples. 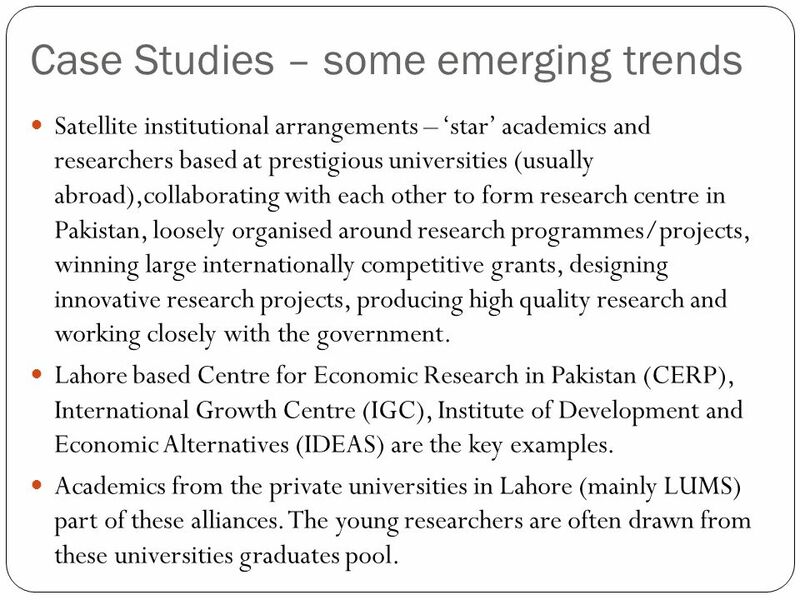 Academics from the private universities in Lahore (mainly LUMS) part of these alliances. The young researchers are often drawn from these universities graduates pool. 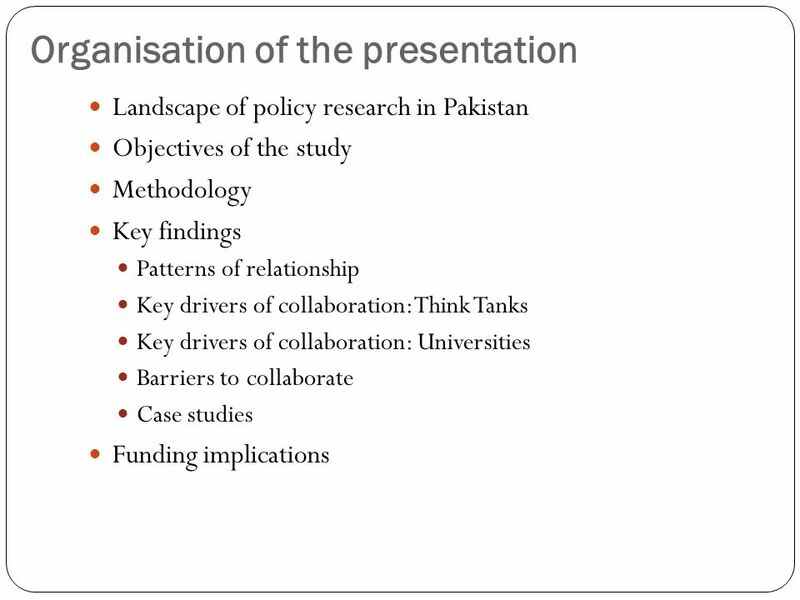 Download ppt "Project Team Arif Naveed, Abid Suleri, Zalla Khattak, Abdur Rab, Abrar Ahmad, Wajeeha Javaid ‘Impact’ and ‘Impact Factor’: The dynamics of the relationship." + Making Web2.0 Researchable Web2.0 and Scholarly Communication innovation and use James Stewart. UK Energy Research Centre WHAT ARE PROGRAMMES FOR? high quality research knowledge transfer/exchange training/capacity building international presence. Every Child Matters: Change for Children Building a world-class workforce for children and young people David N Jones Children’s Services Improvement. Health and Wellbeing Boards: Working Together The Implications of the Health and Social Care Bill 2011 Ged Devereux North West Transition Alliance Health. 1 Improving School Leadership - Guidelines for Country Background Reports - Education and Training Policy Division Directorate of Education. IDRC TTU Event, Nairobi, Kenya May  Research environment in SSA  Universities/university based researchers  Think tanks  NGOs/CSOs  Global. In the Framework of: Financed by: Developed by: Module 2 CURRENT CONDITION ASSESSMENT. GLOBAL COMMUNITIES for SUSTAINABILITY School driven Partnership models for sustainable communities. Awareness Raising for Boards of Governors. Aims for the Session To raise awareness of the context, rationale, aims and objectives and outcomes of the. Awareness Raising Session. Aims for the Session To raise awareness of the context, rationale, aims and objectives and outcomes of the CRED Policy. Academic Enterprise: Working with Business Tempus Study Visit, 1 May 2014 Laura Woods, Director of Academic Enterprise.